Debbie and I continue in the Caribbean, traveling with Tim DeBusk, Director of the Caribbean Work, and his wife, Lisa; Michael Anthony, the Eastern Caribbean District Superintendent, and his wife, Monica; and Deivys Pichardo, the Dominican Republic District Superintendent. On Thursday, March 14, we took a ferry from St. Thomas in the U.S. Virgin Islands to Tortola, British Virgin Islands, arriving in the early afternoon. We had lunch and then toured the Road Town church, which has been rebuilt since being struck back-to-back by two category-five hurricanes in 2017. Hurricane Irma landed first on September 6, bringing with it 200-mile-per-hour winds, causing significant damage to eighty percent of the island structures, including 4,000 homes. Hurricane Maria followed two weeks later, filling the roofless structures with water. In going to a lookout point on the island, we were able to see that over half of the buildings are still undergoing major reconstruction. Of the other half, many have been abandoned. The devastation caused by the hurricanes is staggering. The Anthonys lost fourteen windows and three doors on their home, and this was considered minor by comparison—each of their neighbors lost their roofs. Today, the church building is nearly complete, and on Friday we held a rededication service as well as celebrated the 25th anniversary of its original construction. The service began with a song from the choir and then Brother Michael welcomed everyone, recognizing our team, the government officials who were present, and other guests. The congregation sang several songs throughout including “Great Is Thy Faithfulness,” and a passage of Scripture was read from 2 Chronicles 5:1-14, which tells of Solomon’s Temple being filled with the glory of the Lord at its dedication. During the service, a brief history of the Tortola work was given. In 1938 the East End church was formed, and then in 1969, to accommodate members residing in Road Town and West End, services began to be held in two locations in Long Bush. For many years following, these two groups prayed about purchasing land and constructing a permanent place of worship. Numerous attempts were made toward this end, including obtaining a list of landowners and approaching each with the offer to buy, but every effort was met by obstacles. It was not until a new Chief Minister to the island was appointed that the groups were able to procure a parcel of land. The groundbreaking ceremony took place on Saturday, January 11, 1992, and two years later, the dedication ceremony for the new building was held on February 14, 1994. It is worth noting that Brother Michael’s first visit to the Apostolic Faith was on that occasion. As the service continued, the East End choir provided a musical special, and the pastor, Pearl Smith, shared some remarks. 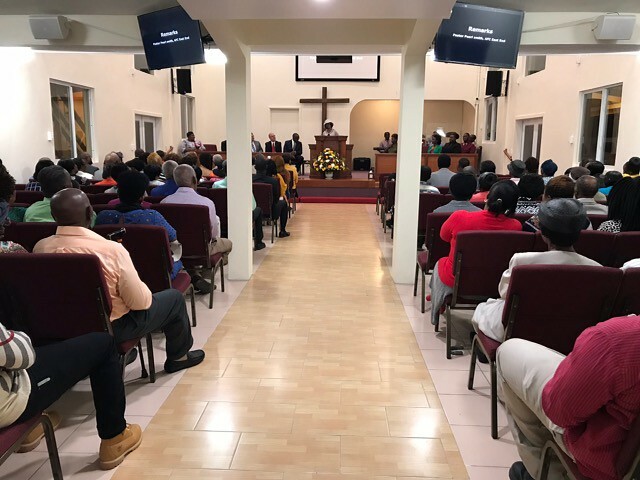 Several others also addressed the congregation, including members from our team and the Deputy Premier of the British Virgin Islands, Dr. the Honorable Natalio Wheatley. Following the dedicatory prayer, and a message by Brother Tim, the service concluded with the benediction given by Brother Michael. The Road Town church is now a monument to what the Lord can do. We give Him the glory for providing the means and the way for the saints to be able to fellowship and worship together again.